“Just as we benefit by combatting inequality within our countries, I believe advanced economies still need to do more to close the gap between rich and poor nations around the globe. This is difficult politically. It’s difficult to spend on foreign assistance. But I do not believe this is charity,” he [Obama] stressed. “For the small fraction of what we spent at war in Iraq, we could support institutions so that fragile States don’t collapse in the first place; and invest in emerging economies that become markets for our goods. It’s not just the right thing to do – it’s the smart thing to do,” said Mr. Obama. “We can only realize the promise of this institution’s founding – to replace the ravages of war with cooperation – if powerful nations like my own accept constraints,” Mr. Obama declared “Sometimes I’m criticized in my own country for professing a belief in international norms and multilateral institutions. “But I am convinced that in the long run, giving up some freedom of action – not giving up our ability to protect ourselves or pursue our core interests, but binding ourselves to international rules over the long term – enhances our security. And I think that’s not just true for us,” he added. Obama’s final UN General Assembly address included a strong endorsement of preventative peacebuilding. This endorsement is the result of a hard-learned lesson–that investing in conflict prevention is much cheaper than fighting wars and/or paying for humanitarian aid to deal with the spillover of conflicts. But Obama’s address also included a lukewarm-at-best embrace of UN Security Council reform. America need not worry about “giving up our ability to protect ourselves”–our military supremacy will continue to keep us safe from “traditional threats” (an invasion by an enemy army). Security Council reform would address the source of the real threats facing America today–failed states and their resulting power vacuums. Failed states allow terrorist groups to take root, and either carry out their own attacks or inspire lone-wolf terrorists remotely. The current UN Security Council structure shields oppressive dictators from accountability, allowing them to hold onto power as they lose control of their countries. By providing an avenue to override a UN Security council veto, the international community would be much more responsive in addressing failing states. Greater protection of democratic aspirations and human rights, through UN Security Council reform, should be how we “pursue our core interest”–peace and prosperity through economic interdependence. If Hilary Clinton is truly the heir apparent to Obama, hopefully she shares his views on preventative peacebuilding. Hillary has taken some flack from the left for being more of a neocon (interventionist) than Obama, but under the right conditions this is actually a good thing. Allow me to explain. Preventative peacebuilding is a very important element of foreign policy–as previously mentioned it saves on future military and humanitarian spending, not to mention the lives saved and economic damage prevented in the host-countries. However, once a conflict is already underway (prevention is never foolproof), it must be addressed before it become intractable (a la Syria, the issue Obama say’s he has second-guessed the most of any during his presidency and for good reason, because his approach has failed spectacularly). Trump is right about one (I stress, ONE) thing–our allies need to start paying their share to uphold global security. Furthermore, there must be repercussions for them not doing so, otherwise the status-quo of America footing the bill will persist (Obama’s denunciation of “free-rider” allies is just rhetoric, it won’t accomplish anything). This in NO WAY means I support Trump’s overall outlook on international affairs, which includes: praising strongmen like Putin and Saddam Hussein who undermine global security, alienating Muslim allies and providing fodder for terrorist propaganda with blanket statements about Islam, and pledging to dump more money into the military without any coherent plan of how to use it (which could actually harm servicemen and women, vets, and their families). America’s future President should adopt a foreign policy that is a large part Obama (preventative peacebuilding), part Hillary Clinton (willingness to intervene before it is too late), and a little bit Trump (willingness to exert pressure on our allies to pay their fair share for global security). UN Security Council reform would bolster each of these pillars of American foreign policy. No element of this foreign policy equation can be foregone if global security is to be upheld in a way that promotes sustainable development in the world’s poorest regions, while leaving America with enough resources to adequately and responsibly invest in its own future (its citizenry’s human capital and physical infrastructure). Categories: Blog Posts, Conflict Watch, Economic Outlook, Green News, Transparency Report | Tags: Clinton, conflict prevention, democracy, Human Rights, Obama, Preventative Peacebuilding, Security Council, Sustainable Development, Trump, UN, UNSC | Permalink. Two weeks ago, the Obama Administration hosted a summit in Washington D.C. on countering violent extremism. With terrorist organizations such as ISIL and Boko Haram massacring people with relative impunity, high ranking government officials from around the world, representatives from the United Nations, and experts in the field came together to discuss how best to counter such groups. Without trivializing the essential role of military operations, there is a growing consensus that a comprehensive, multi-dimensional approach is needed to effectively counter terrorism. A military response alone does not address the root causes which enable the formation and continued operation of extremist organizations, and can be counter-productive by fueling anti-Western propaganda (drone warfare has been particularly contentious in this regard). An important component of this multi-dimensional approach is the promotion and protection of human rights. This sentiment was echoed by both President Obama and Secretary General Ban Ki-moon. As he sought to rally the world behind a renewed attack on terrorism, President Obama argued on Thursday that force of arms was not enough and called on all nations to “put an end to the cycle of hate” by expanding human rights, religious tolerance and peaceful dialogue. But the challenge of his approach was staring him right in the face. His audience of invited guests, putative allies in a fresh international counterterrorism campaign, included representatives from some of the world’s least democratic and most repressive countries. Critics say the terrorism fight has simply enabled autocratic regimes to go after their political foes without worrying about American disapproval. Egypt’s leaders, for instance, have moved to stifle the Muslim Brotherhood, the opposition group they deem too radical. “It is futile to distinguish between bad terrorists, which must be defeated, and good terrorists, which can be accommodated,” Mr. Shoukry said. The White House acknowledged the disconnect between advocating human rights and teaming up with human rights violators. But aides said it was one Mr. Obama had learned to live with, given the importance of maintaining an international coalition to fight the Islamic State and other terror threats. “Many years of our experience have proven that short-sighted policies, failed leadership and an utter disregard for human dignity and human rights have causes tremendous frustration and anger on the part of people who we serve,” the UN chief said. …preventing violent extremism requires a multi-pronged approach. While military operations are crucial, they are not the entire solution. “Bullets are not the silver bullet,” Mr. Ban said, emphasizing that while missiles may kill terrorists, good governance kills terrorism. “Human rights, accountable institutions, the equitable delivery of services, and political participation – these are among our most powerful weapons,” the Secretary-General stressed. If such a consensus exists around the significant role human rights violations play in a variety of negative outcomes (including violent extremism), why don’t policymakers do more to promote human rights? One explanation is that human rights encompass many issues: economic, social, cultural, political and civil rights. Furthermore, no consensus exists with regards to the hierarchy of human rights. Fulfilling some human rights obligations are inherently expensive (economic and social rights), while others have more to do with those in power loosening their grip (political, civil, and cultural). In other words, human rights include both positive and negative rights. Which rights should be prioritized in a world of finite resources and political capital? I am of the camp that believes human rights are inter-dependent; one human right violation enables others, culminating in armed conflict and/or “extreme poverty”. Therefore, there really is no hierarchy. The exception to this rule is the right to life / security; a violation of this right (murder) is permanent and obviously must be upheld before other rights can be considered. This reality is often bastardized to justify restricting rights in the name of security, an issue I will address later in more detail. Another issue is that the “ends” of promoting some human rights are not immediate, which historically has made verifying progress difficult. To this end, the UN’s Post-2015 Task Force has placed an emphasis on developing indicators for previously non-quantifiable aspects of human rights. These indicators can help verify when progress is being made on longer-term goals, and when ineffective programs need to be adjusted or scrapped. Promoting and protecting human rights, while admittedly an ambitious goal, gives direction to sustainable development agendas (likes the SDGs / post-2015 development agenda) in both “first world” countries and the world’s least developed countries. Specifically which rights should be prioritized is context sensitive and should be identified through the democratic process. Many of America’s partners, particularly in the Middle-East, are authoritarian regimes which do not share our beliefs in pluralism and human rights. These regimes tend to fight extremism by further restricting peoples rights in the name of security, exacerbating a vicious cycle of violence, under-development / poverty, and human rights abuses. They often characterize any dissenters as “terrorists”, even if their actions are entirely peaceful. But relying solely on “Western” actors is not financial sustainable or effective, as it fuels the “Western Imperialism” terrorist narrative. Regional partners must play a leading role in combating extremist activities and ideologies. Although imperfect, we must work with these partners as they are, while simultaneously cultivating local support for human rights. Even our “democratic” allies may find it in their best interest to restrict certain rights. Take Egypt for example, where extremist violence has led to popular support for an unaccountable military regime. One could certainly argue that it is in the Egyptian governments best interest to manage, but not eliminate, violent extremism. And of course, the American-led coalition has its limits–for example, it refuses to work with the Assad despite the military benefits such a partnership would entail. Human rights accountability outlines the responsibilities of different actors–corporations, the public sector, international development organizations, NGOs, and civil society–in promoting and protecting human rights. National Human Rights Institutions (NHRI), which have proliferated over the past two decades, can act as human rights watchdogs. These institutions are most effective when they have a strong mandate, a working relationship with the criminal justice system, and receive their funding independently of federal budgetary decisions. The unfortunate irony is that in the very places that could benefit the most from effective NHRIs, these conditions are not met. Critics argue NHRIs are ineffective and put in place to create the illusion of promoting and protecting human rights. While this may be true in some cases, it is not in all; ultimately, NHRIs can be as effective or ineffective as their mandates and operating space allow. The absence of an American NHRI is particularly conspicuous. While America does have strong protections of many rights, it lags in other areas (particularly privacy concerns). A NHRI could provide a forum for people to directly address grievances against the government. Perhaps the whole Snowden debacle could have been averted with a functioning ombudsman system. An American NHRI could be an political mouthpiece for people, helping to restore faith in the American government (which, sadly, is the lowest amongst the financially insecure–the very people who could benefit from public policy the most). Who knows, an American NHRI institution could play a part in jump-starting stagnant wages and promoting social mobility! While far from a cure-all, an American NHRI could “punch above its weight” in terms of resources required to run it. Perhaps most importantly, an American NHRI would act as a model for NHRIs in other countries, assisting with financial support, technical knowledge, and capacity building. An American NHRI would unaccountably be a strong voice within the the international coordinating committee (ICC) of NHRIs. These are hypothetical results, and the presence of effective NHRIs does not mean the realization of human rights would progress in a perfectly linear fashion. The closer people get to acquiring new rights, the harder vested interests dig in against them. This is what is playing out now in the Middle-East and in the Ukrainian Civil War–extremists and authoritarians clinging to the remnants of an old order. Note: This blog focused exclusively on the relationship between human rights and violent extremism. Click the following links for more information on the linkages between human rights, armed conflict, and economic development (which are themselves related root causes of violent extremism). In Development as Freedom, Amartya Sen argues promoting human rights is not only a means to an end (“positive peace“, sustainable development, poverty and inequality reduction), but also an important end in itself (empowering people, enabling self-determination)–I fully agree! Taking a holistic view of the benefits of upholding international human rights norms, an even stronger argument can be made for their promotion and protection. Categories: Blog Posts, Conflict Watch, Economic Outlook, Transparency Report | Tags: authoriatian, Ban Ki-moon, boko haram, democracy, democratic governance, extremist, Human Rights, isil, ISIS, Modernization, NHRI, Obama, ombudsman, pluralism, Post 2015 development agenda, Sisi, Terrorism, UN | Permalink. In addition to the direct (tuition, room and board, cost of living) and “opportunity cost” (foregone wages) of attending college, there is mounting evidence that suggests there is an emotional / psychological cost associated with taking out student loans. Despite the intense interest in this issue among researchers, this is the first paper that attempts to understand the emotional cost of carrying student loan debt. This question is, in fact, more fundamental than the others being posed in this genre of research, since it could help to explain the mechanism through which debt may be affecting other outcomes (i.e. emotional health, graduation rates). Based on their analysis, the authors report, “cumulative student loans were significantly and inversely associated with better psychological functioning.” In other words, individuals with more student debt reported lower levels of psychological health, when other things are held constant (including occupation, income, education and family wealth). The effect is statistically significant, but it is quite small. They also find that “the amount of yearly student loans borrowed was inversely associated with psychological functioning,” which implies that taking on debt is emotionally costly for students. High numbers of students are beginning college having felt depressed and overwhelmed during the previous year, according to an annual survey released on Thursday, reinforcing some experts’ concern about the emotional health of college freshmen. The survey of more than 150,000 students nationwide, “The American Freshman: National Norms Fall 2014,” found that 9.5 percent of respondents had frequently “felt depressed” during the past year, a significant rise over the 6.1 percent reported five years ago. Those who “felt overwhelmed” by schoolwork and other commitments rose to 34.6 percent from 27.1 percent. More U.S. students continued to borrow larger sums for their college education last year, according to data from the Federal Reserve Bank of New York, while total student loan balances tripled over the last decade. At 43 million, the number of student borrowers jumped 92 percent from 2004 to 2014, while their average balances climbed 74 percent, according to New York Fed researchers. The average balance was some $27,000. Obviously correlation does not prove causation. But given the logical link between debt, depression, and dropping-out of school, these trends cannot be purely coincidental–more research on the subject is needed. While I cannot speak personally about the burden of student loan debt, I have experienced depression first hand, and understand how being depressed could make one more likely to drop out of school. Depression is particularly difficult to battle in a college atmosphere. The pressure to maintain a social life, despite anxiety and financial issues, can reinforce negative feelings associated with depression. The abundance of drugs and alcohol certainly does not help the situation either. The general pessimism which accompanies depression compromises a person’s ability to clearly assess long term goals, such as completing a degree. Depression also affects ones cognitive abilities, hampering academic outcomes. I can only imagine the pressure on someone who is both depressed and has student loan debt to consider; some combination of the two surely accounts for more low-income drop-outs than is currently recognized. I had to take a semester off to get myself back in the proper state of mind to complete my degree; not everyone has this luxury. However, everyone should have the support needed to realize their educational and emotional potential. Due to my personal experiences and knowledge of economics, I vehemently support President Obama’s proposed Community College plan. Lower income students could learn if pursuing a bachelor’s degree is “for them” without taking out tens of thousands of dollars in loans, likely leading to better emotional, educational, and economic outcomes. 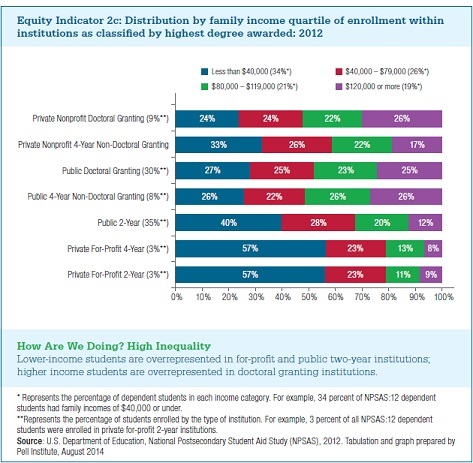 Furthermore, community colleges are more likely to have the the social counseling and financial advising services missing from for-profit universities, which predominantly attract low income students. The Obama administration is attempting break the vicious cycle of student debt, emotional suffering, and dropping-out of college. Dropping out of college with student loan debt in a competitive global economy is a poverty trap for low income individuals, and has become a drag on economic growth in the macro. By expanding mental health parity through the ACA, getting treatment for depression is no longer a luxury reserved for the wealthy. If our lawmakers pass a free community college bill, the synergy between these two public policies would go a long way towards bringing equity to America’s higher education system and reinvigorating the American Dream. Categories: Blog Posts, Transparency Report | Tags: ACA, community college, depression, equality of opportunity, for-profit college, graduation rates, Mental health, meritocracy, Obama, opportunity cost, Poverty trap, social justice, studen debt, student loans | Permalink. “The question is never whether America should lead, but how we should lead,” Mr. Obama writes in an introduction to the document, a report that seems to mix legacy with strategy. In taking on terrorists, he argues that the United States should avoid the deployment of large ground forces like those sent more than a decade ago to Iraq and Afghanistan. In spreading democratic values, he says, America should fight corruption and reach out to young people. The strategy lists eight top strategic risks to the United States, starting with a catastrophic attack at home but including threats like climate change, disruptions in the energy market and significant problems caused by weak or failing states. Regardless of your opinion on how effectively the Obama administration has handled foreign affairs, it is hard to argue the United States is not leading from the front on major global issues. Yet it is important that our future leaders recognize, as President Obama has, the limits of both our government’s resources and our ability to sustain democratic revolutions through unilateral military intervention. In a highly interconnected world, confronting global problems is in America’s economic and security interests (not to mention ethical considerations). This does not mean, however, that we should rush headlong into battle without carefully considering the probability of success and costs of alternative courses of action. There are other tools in America’s foreign policy toolkit–the other components of the D.I.M.E (diplomatic, intelligence, military, economic) framework–which should be considered before sending our military (and particularly ground troops) to war. Military interventions are never quick, easy, or cheap. Even when successful, they leave a power void that must be carefully managed, lest that void be filled by ineffective leaders or extremist groups (or, as is often the case, both). When mismanaged, even the most well intended interventions can be counter-productive, fueling anti-Western propaganda and empowering the very ideologies we seek to destroy. American tax dollars are a precious resource. Every dollar we spend abroad is a dollar we cannot use for nation building at home. The American government is solely responsible for managing America’s domestic affairs, but we have many allies who share the same ideologies and interests as us (and who should therefore more proportionately shoulder the cost of defending them). Hagel, making his final appearance at NATO as U.S. defense chief, said the alliance faced several challenges, including violent extremism on its southern rim, Russian aggression in Ukraine and training security forces in Afghanistan. “The alliance’s ability to meet all these challenges at once, to the east, to the south and out-of-area, is NATO’s charge for the future,” Hagel said. Often times, one can speak most candidly when their tenure at a position is coming to an end. Those who oppose the ideals of NATO will not coordinate their attacks one at a time. In fact, knowledge that NATO resources are strained (due to say, simultaneous humanitarian crises, a wear weary American public, or underinvestment in the global security commons by the rest of the international community) is only likely to embolden our enemies. While NATO needs to be able to effectively counter more than one major threat at a time, this does not mean the American army alone needs that capacity. As the world becomes “smaller”, the exclusively Northern Atlantic nature of NATO should be reconsidered. Two major democracies–India and Japan–are not members of NATO, limiting the groups ability to fulfill its goals. Furthermore, having regional actors involved in security operations helps builds legitimacy, underscoring the strategic importance of greater Indian and Japanese involvement. President’s Obama and Modi recently met and discussed, among other things, defense cooperation. India must become a major partner in promoting peace and democracy in the Middle-East (particularly in coordinating the fights against the Afghan and Pakistani Taliban) even as it itself modernizes. There have been sharp disagreements over the 2013 coup in Egypt, the Israeli-Palestinian conflict and the need for intervention in Syria. Turkey’s critics have called into question its reliability as a NATO ally, including in the fight against the radical Wahhabi group known as the Islamic State. But much of this concern is misguided. The ongoing crises in the Middle East have only underscored Turkey’s pivotal geostrategic position: It’s no surprise that Pope Francis, President Vladimir V. Putin of Russia and Prime Minister David Cameron of Britain have visited Ankara in the past few months. And Turkey’s detractors, partly because they do not understand the sources of its new assertiveness, fail to see that its transformation actually serves America’s long-term interests. The United States has long allowed client states like Saudi Arabia, the United Arab Emirates and Israel to pursue shortsighted goals in the Middle East. This has only brought despotism and strife. Washington’s failure to fully support the democratic government of Mohamed Morsi and his Muslim Brotherhood in Egypt contributed to its collapse, and so to the instability and violence that have occurred there since. And it was President Obama’s cynical abandonment of the Syrian opposition during the first two years of the uprising against Mr. Assad that set the stage for the advent of the Islamic State. To avoid any more such calamities, policy makers in Washington, and other Western capitals, should abandon their counterproductive approach: They should embrace Turkey’s growing, and positive, engagement in the Middle East. But I do not think America’s leaders are opposed to Turkey asserting itself in the Middle-East. Indeed, as a primarily Muslim democracy and NATO member, it must play a large role in Obama’s plan of relying more heavily on regional partners in curtailing Islamic extremism. I agree the Obama administration was wrong on Syria and Egypt, I am on the record saying as much. But in this case, two wrongs don’t make a right. Turkey cannot afford to play the moral high ground on these issues while the dogs of war bark at it’s door-step. Furthermore, Erdogan’s delayed and half-hearted support of the Kurdish peshmerga reeks of political calculus, not someone who considers ISIS a serious threat to regional stability. So I am not exactly sure what these professors are talking about–they appear to be building a straw-man just to knock him down. I think it is pretty clear the Obama administration wants more Turkish involvement, including ground forces, in the fights against Assad and ISIS, not less. Prime Minister Shinzo Abe has said that he wants to start the process of revising Japan’s Constitution as early as next year, a senior lawmaker in his party said Thursday, giving the clearest indication yet that the Japanese leader will seek to change a document that has undergirded the country’s postwar pacifism. The Constitution, which also prohibits Japan from possessing the means of war, was written by American occupiers after World War II to prevent the defeated nation from ever again engaging in militarist expansion. The document proved so popular among Japan’s war-weary people that it has never been amended. But Mr. Abe has seized on the murders of the Japanese hostages to make some of his strongest appeals yet for unshackling the nation’s military. Saying Japan was unable to save the hostages, he has called for easing restrictions on its purely defensive armed forces to allow them to conduct rescue missions, evacuations and other overseas operations to protect Japanese nationals. The hostages, Kenji Goto, a journalist, and Haruna Yukawa, an adventurer, were beheaded a week apart by the Islamic State, a militant group in Syria and Iraq that had demanded a $200 million ransom for their release. The murders outraged and sickened Japan, which had seen itself as largely immune to the sort of violence faced by the United States and other nations that have been involved militarily in the Middle East. Since 1945, Japan has adhered to a peaceful brand of diplomacy that has seen it become a major donor of economic and humanitarian aid to the Middle East and elsewhere. It remains unclear whether the shock of the killings will swing the Japanese public in favor of Mr. Abe’s harder line. Since the murders, opposition politicians have stepped up attacks on the prime minister, accusing him of provoking the Islamic State by allying Japan more closely with the United States-led efforts to destroy the militant group. Just days before the ransom demand appeared, Mr. Abe pledged $200 million in nonmilitary aid to countries in the region confronting the Islamic State. However, on Thursday, the lower house of Parliament unanimously adopted a resolution condemning the killings and calling for increased coordination with the global community to combat terrorism. Germany must ramp up defense spending starting in 2016 to ensure its military is able to take on a bigger role in crisis zones, according to two top lawmakers in Chancellor Angela Merkel’s coalition. Germany spends about 1.3 percent of gross domestic product on the military, short of the 2 percent level pledged informally by North Atlantic Treaty Organization allies. Merkel’s spokesman has said no additional funding will come in the short term as the government struggles to hold on to its target of balancing the budget next year and with 2015 spending already largely negotiated. Germany must engage in international missions “earlier, more decisively and more substantially,” Gauck told the Munich Security Conference on Jan. 31. Fiscal responsibility is usually good, but like anything, overzealous attachment to an ideology can preclude pragmatic policy. Economics is context sensitive, and in the current context, Germany’s dedication to running a balanced budget has left holes in the Eurozone economy and the global security commons. A large scale increase in German defense spending would bolster global security efforts (particularly in countering Russian aggression in former Soviet Republics), while simultaneously providing a partial answer to Europe’s economic stagnation (by “buying European“). Please do not confuse my views with war-mongering or advocating for the military-industrial complex, I just recognize that there are bad actors in the world who only understand realpolitik. In order to provide room for the forces of human dignity and freedom to flourish, these bad actors must be marginalized. Categories: Blog Posts, Conflict Watch | Tags: boko haram, democracy, dignity, DIME, Erdogan, EU, extremist, Germany, global commons, Global Security, global security commons, Human Rights, India, ISIS, Islamic, Japan, Merkel, Modi, NATO, Obama, Preventative Peacebuilding, Shinzo Abe, Sustainable Development, Taliban, Terrorist, Turkey, UN | Permalink. Since President Obama’s SOTU address, the term “middle class economics” has penetrated mainstream political discourse. These were not all new ideas, but rather a catchy phrase to sum up the priorities of the Obama administration and provide direction for the Democratic party going forward. Of course, in a functioning democracy, broad based growth is not (or should not be) a partisan position. A recent NYT news analysis article highlighted how the G.O.P. has, in recent years, attempted to re-brand itself to be more appealing to low and middle class Americans (i.e. engage in “middle class economics”). One potential avenue for such re-branding is compromising on a long overdue overhaul of the American tax system (the last major overhaul was in 1986). According to a recent Al Jazeera America poll, a majority of self-proclaimed Democrats (79%) and Republicans (68%) are “somewhat” or “very” willing to have their congressional leaders compromise on taxes. “Though there are disagreements on the details, there is bipartisan support for tax reform in Congress,” said Orrin Hatch, Republican chairman of the Senate Finance Committee, at a conference for tax lawyers, analysts and economists. “Members of both parties have expressed their support for a tax overhaul. And, I believe there is real momentum to get something done on tax reform this year, if we remain committed. And, believe me, I’m committed,” he said. The U.S. tax code has not been overhauled thoroughly in 28 years. In that time it has become riddled with loopholes. As a result, tax avoidance is a growing problem. At the same time, tax experts also generally agree that the system is so complex and often contradictory that compliance costs are excessive and economic productivity is harmed. Hatch has laid out basic principles for reform. At the conference, he said he has the impression that Democratic President Barack Obama might be willing to do a deal on business tax reform alone, setting aside individual income tax issues. “We need to lower corporate tax rates and transition toward a territorial tax system,” Hatch said. A territorial system is one that would exempt all or most of the foreign profits of U.S. corporations from the corporate income tax. I continue to believe that the best way to achieve reform today is to start with pro-growth business tax reform that protects and strengthens the middle class, lowers rates, simplifies the system, levels the playing field, and eliminates unfair and inefficient loopholes. The fact is, there is a growing bipartisan consensus in Washington on how to achieve business tax reform, and we have a unique opportunity now to get this done. On paper, we have one of the highest corporate income tax rates in the world, but in practice, there is a wide disparity in effective corporate tax rates. Some corporations pay little or no income tax at all, while others pay the highest rate in the developed world. Moreover, our business tax system is far too complicated — particularly for small businesses. One estimate suggests that a small business, on average, devotes hundreds of hours plus spends thousands of dollars, to comply with the tax code. We can and must reduce this burden. Our business tax system actually skews business decisions in ways that make it harder for the economy to grow. Too many investment decisions are shaped by tax considerations when they should be driven by what will best enhance productivity and growth. Our tax code should favor the best businesses that create the most economic value — not those that are best at taking advantage of tax deductions. The international tax system is often looked at in terms of either what is known as a territorial system, in which a company located in a particular country only pays taxes on income earned in that country, or a system like that of the United States, in which that company must pay tax on worldwide income, regardless of the country where it is earned. The President’s proposal strikes a sensible balance, and would move us towards a more hybrid system. What that means is we would create a new minimum tax on foreign earnings and make it simpler for a business to bring income back to the United States. It would also tighten the rules so that companies cannot use accounting techniques to avoid paying taxes, such as shifting profits to low-tax countries (inversions). Of course, there are tax expenditures that make sense and that need to be protected — like the New Markets Tax Credit, expensing for small businesses, and the Research and Experimentation Tax Credit. But these tax incentives cost money and need to be paid for to maintain adequate revenue levels. And we cannot apply a double standard, as some have proposed, where we permanently extend business provisions without paying for them, without permanently extending critical improvements to the EITC, child tax credit, and college credits that help working families at the same time. 1. Lower rates and close wasteful loopholes. 2. Build on the resurgence of manufacturing in the United States. 3. Reform the international tax rules that encourage companies to shift income and investment overseas. 4. Simplify and reduce taxes for small businesses. Sounds like both parties want many of the same things. However, “revenue neutral” business tax reform does not go far enough. Looking at the Federal OMBs Historic Tables (p34-35) tells the story. Since 1934, individual income taxes have consistently made up 40+% of government receipts, while corporate income taxes have varied from as high as 30% to around 10% of receipts in recent years. True this declining share is partially due to rising Social Security taxes, but since those are split evenly between employers and employees, it is clear that the burden of financing our government has shifted from corporations to people and small businesses. Looking at contributions as a % of GDP (p36-37) further supports this narrative. These meager contributions by corporations are symptoms of an outdated and unfair tax code, and should not be enshrined in a new one. Lower tax receipts skew the debate over how to invest in America and her people. Operating from a position of high debt and primary deficit, it is easy to drum up fears that accommodative economic policies will result in rising borrowing costs, ballooning deficits, and [hyper]inflation (despite the fact that America is facing the opposite–historically low borrowing costs, a shrinking deficit, and a very strong dollar). Implementing business tax reforms would help push America into primary surplus, changing the context of this national debate. I do not claim to know the exact amount or proper allocation of resources between public goods (education, infrastructure) and welfare programs needed to achieve greater “equality of opportunity” / social mobility. But I can say with confidence that more resources need to go to these causes, as the status-quo has long failed the vast majority of Americans. The sooner we can have a clear-eyed debate on what policies are needed to promote broad based, sustainable American growth, the better. Holding back this debate, aside from uncompromising politicians, is a failure to overhaul our tax code. In the interest of balance, work also needs to be done on individual tax reform, to fix high marginal tax rates affecting people who benefit from welfare programs. However, the importance of this issue has been, in my opinion, overblown by those on the political right. Lastly, the Congressional Budget Office’s use of “dynamic scoring”, as it as been pushed through by the G.O.P. dominated congress (using it for tax proposals but not for spending bills) is another impediment to achieving social justice through tax reform and fiscal policy. Van Hollen (D-MD) added that while the bill requires the CBO to run dynamic analyses on major bills, it specifically excludes appropriations bills. He said that exemption shows that Republicans want to downplay how federal spending on education, infrastructure and other areas can also help the economy. Ryan replied by saying that exemption is there because subjecting all spending bills to dynamic scoring would create significantly more work for the budget office. Rep. Gerry Connolly (D-Va.) proposed an amendment to include major spending bills, but the House rejected it 182-214. Ryan’s argument is unfounded and offensive to the talented people employed by the CBO. It is a weak attempt to defend wealthy interests, while downplaying the awesome potential of the American people. Ideally, this method would be implemented for both tax and spending proposals. If that is not possible, dynamic scoring should not be used at all. Categories: Blog Posts, Economic Outlook | Tags: appropriations, congress, Democrat, dynamic scoring, education, GOP, infrastructure, middle class economics, Obama, social justice, social mobility, tax reform | Permalink. President Obama’s forthcoming budget plan will not include a proposal to trim cost-of-living increases in Social Security checks, the gesture of bipartisanship he made to Republicans last year in a failed strategy to reach a “grand compromise” on reducing projected federal debt. White House officials said on Thursday that since Republicans in Congress have shown no willingness to meet the president’s offer on social programs by closing loopholes for corporations and wealthy Americans, the proposed budget for the 2015 fiscal year will not assume a path to an agreement that no longer appears to exist. The budget plan, which will be out in early March, a month late, will abide by the overall spending guidelines agreed to by Republicans and Democrats late last year. But included in those spending limits will be a $56 billion proposal to increase spending on some of Mr. Obama’s key initiatives, officials said. Mr. Earnest said that would include spending on manufacturing “hubs” that the president has promoted over the last year; additional government programs aimed at helping people develop new skills; and funding for early childhood education programs like preschool. “This initiative that the president will propose will be fully paid for,” Mr. Earnest said. White House officials declined to describe the revenue increases, but said they would include closing corporate loopholes, a move the president has supported in the past. Mr. Buck criticized the $56 billion proposal as another effort by the president to spend more taxpayer money than the government can afford. Administration officials said Thursday that the budget would include proposals to make good on the president’s campaign promise to eliminate provisions of the tax code that allow corporations to shift profits overseas to evade their obligations. Democrats say such provisions are loopholes, and Mr. Obama’s calls to end them are a perennially popular line with voters of both parties and among independents. Democrats and Republicans agree there is virtually no chance again this year of a bipartisan overhaul of the corporate tax code, despite claims by both parties to be in favor of such change. The proposed changes to the overseas tax provisions would raise additional revenues of several billion dollars a year. President Obama’s proposal also includes some $300 billion in infrastructure spending, to be paid for by closing certain tax loopholes. When those on the political right talk about “fiscal responsibility”, they focus solely on cutting social programs. They buy into the notion (or perhaps have been bought into the notion via lobbying / campaign finance) that closing any tax loopholes will cause unemployment to soar. And people believe them, Why is that? Because regular people experience over-taxation and over-regulation in their daily lives. 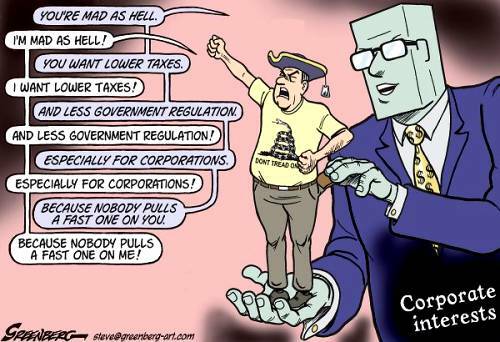 They do not realize that the very wealth people, and the corporations they control, do not play by the same rules. Sensationalism is good for two things: 1) distracting people from the real issues and; 2) paralyzing your opponents into inaction. Remember when high levels of U.S. sovereign debt was supposed to cause soaring interest rates? When QE easing was supposed to cause runaway inflation? Every once in a while, you have to call someones bluff to keep them honest; the time is past due for politicians to collectively call the bluff of corporate interests. One look at the historic tax revenue tables (p 34-35) tells the story; for decades households have paid a relatively steady portion of income tax revenues (between 40-50%) while corporate contributions have been wildly volatile (from upwards of 30% in the years following WWII, to single digit percentage contributions many years starting in the 80s). In 2009, households contributed 43.5% of U.S. income tax revenue; corporations contributed 6.6%. The U.S. has one of the highest corporate tax rates in the world, at 35%. We also have one of the most complex and loophole ridden tax codes in the world. Corporations find themselves largely off the hook, while households continue to contribute their share towards making the government work. 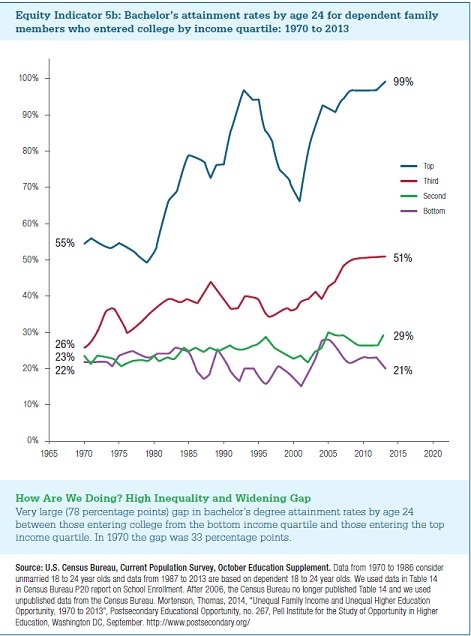 The results are obvious; even during times of economic growth, we see widening inequality accompanied by record corporate profits. Mr. McConnell, the Senate minority leader, said efforts to pass the proposal — which is expected to call for a cut in the top corporate income rate to 25 percent from 35 percent, and a reduction of the seven individual tax brackets to two — would prove insurmountable against Democratic demands that any tax overhaul include $1 trillion in new revenue. Senator Harry Reid of Nevada, the majority leader, agreed with Mr. McConnell’s assessment that a tax overhaul will be difficult to push through Congress this year, but he blamed Republicans for the impasse. The Biblical phrase, “from each according to their ability, to each according to their need” (Marx took it from the Bible) is a pretty solid baseline for tax policy. When looking to fiscal reform, it is irresponsible (not to mention un-Christian, not that I am a religious man but many in this country purport christian values) to deprive societies most vulnerable of the bare minimum to lead dignified lives. This is not charity; young people need a minimum investment in order for them to become productive citizens. Those who are not lucky enough to be born into wealth are no less deserving of such opportunities. It is essentially what economists call “consumption smoothing” ; In law enforcement, it is know as “I’m the guy you pay later“. There is a general consensus for closing a major loophole is offshore tax evasion / minimization. While tackling such an issues is a difficult task, we even have the requisite international support needed for tackling this global issue. The only people who are opposed to closing such a loophole it seems are (surprise, surprise) Republican lawmakers. The U.S. government has already taken steps towards holding past violators, such as Credit Suisse, accountable. This is one half of the problem, the other half is taking all possible steps to prevent future tax fraud through laws like FATCA. Another area worth exploring is the winding down of corporate welfare programs. Obama has spent too much time learning his lessons. He came into power with a Democratic super-majority and squandered the opportunity in the pursuit of a Golden Age of political compromise and pragmatism. This goal has, beyond any shadow of a doubt, failed miserably over the past 5 years. It seems Obama has finally learned his lesson. With an eye on regaining a Democratic super-majority in the 2014 midterm elections, He has shifted from his plan for a “Grand Compromise”, to laying out a grand vision for the role of the American government. Until that point (and depending on the outcome of the elections, perhaps past that point) he will use executive actions to push whatever reforms he can. By clearly laying out his vision, Obama intends to let Americans decide what role they think the Federal government should play. Disclaimer: It should not have to be this way. America should not need one party to have a super-majority to enact common sense policy reforms. Indeed, in the long run it is counter-productive to not have meaningful deliberation on major issues. This, ladies and gentlemen, is what governance should look like; I for one do not care which side of the political isle it comes from. Categories: Blog Posts, Economic Outlook | Tags: Austerity, boehner, budget, david camp, midterm elections, Obama, Stimulus, tax code, tax loophole, tax reform | Permalink. The “Prisoners Paradox“–the idea that longer prison sentences, as opposed to their stated goal of deterring crime, actually perpetuate a criminal culture, has been a recurring theme here at Normative Narratives. Their are undeniably certain instances where criminals pose a danger to society and must be kept behind bars. However, since stricter drug laws were enacted in the 1980s, U.S. prisons have filled up with largely non-violent offenders. Keeping people in prison has obvious direct costs (as of 2010, the average cost for an inmate in a state prison was $31,246/yr; federal inmate was $28,284). According to the ACLU, with only 5% of the world’s population, the U.S. has 25% of the world’s prison population. In America, Prison is big business. Federal prosecutors routinely threaten extraordinarily severe prison sentences to coerce drug defendants into waiving their right to trial and pleading guilty, Human Rights Watch said in a report released today. In the rare cases in which defendants insist on going to trial, prosecutors make good on their threats. Federal drug offenders convicted after trial receive sentences on average three times as long as those who accept a plea bargain, according to new statistics developed by Human Rights Watch. Prosecutors favor mandatory sentences because they enhance their leverage not only to get convictions via pleas, but to get defendants to cooperate with the government in the prosecution of others in exchange for a lower sentence. Of more interest to social scientists–and at the core of the “Prisoners Paradox”–are the social and communal effects of incarceration. Incarceration causes skills to atrophy and carries a social stigma; many ex-cons cannot find honest work and end up back in jail. Incarceration robs children of a parent. Children growing up in single-parent households are much more susceptible to a wide array of social issues. The Obama administration, in its effort to curtail severe penalties in low-level drug cases, is taking the unprecedented step of encouraging defense lawyers to suggest inmates whom the president might let out of prison early. Speaking at a New York State Bar Association event Thursday, Deputy Attorney General James M. Cole said the Justice Department wanted to send more names to White House for clemency consideration. “This is where you can help,” he said, in remarks the Justice Department circulated in advance. Prison officials will also spread the word among inmates that low-level, nonviolent drug offenders might be eligible to apply for clemency. The clemency drive is part of the administration’s effort to undo sentencing discrepancies that began during the crack epidemic decades ago. Testifying on Capitol Hill on Wednesday, Attorney General Eric H. Holder Jr. said the Bureau of Prisons now eats up 30 percent of the Justice Department’s budget, which strains the department’s ability to do other law enforcement missions. Last August, Attorney General Eric Holder urged judges to consider less harsh sentences for non-violent drug offenders going forward. The clemency push is an important retroactive decision, which can ensure those who committed a crime “at the wrong time” don’t continue to face indefensibly long prison sentences. One can already hear the criticisms now; President Obama, friend of the criminal! President Obama, defender of the lazy drug user! However, many people convicted of drug-related offenses experience injustice throughout the criminal justice system–from arrest, to trial, to sentencing. Letting criminals out of jail will not solve all of our problems. However, keeping people unjustly locked up for long periods of time has certainly perpetuated lingering socio-racial issues in America. Clemency is not meant to undermine personal accountability; people need to suffer negative consequences for socially unacceptable behavior or there is way of deterring such behavior. What clemency and a reworked criminal justice system can accomplish is proportionality–ensuring that once someone “has learned their lesson”, they do not remain incarcerated to the detriment of all involved (except, I suppose, those who run the prison). If there is a policy that will reduce the governments prison bill and may reduce future dependence on government welfare spending–without compromising the security of law abiding Americans–do we not owe it to ourselves as a country to pursue such a policy? Categories: Blog Posts, Economic Outlook | Tags: ACLU, executive order, minimum sentence, non-violent offender, Obama, plea, prison industrial complex, prison reform, prisoner paradox | Permalink. Mr. Putin is using the UNSC, like he has the concept of national sovereignty, as a shield for human rights violators, and evoking the specter of past wars to paralyze the international community into inaction. Don’t trust Vladamir Putin because he writes an op-ed in the NYT. Do not trust Assad; while no one’s hands are clean in the Syrian Civil War, Assad has committed human rights violations on a drastically larger scale than have extremist elements of the Syrian opposition (perhaps supporting the argument that a legitimate Syrian opposition is still in control on the ground despite reports of increased extremist influence). Syria’s civil war is a fight for democracy; it started as peaceful protests for basic human rights and dignity. The longer the international community is paralyzed, the further legitimate grievances are highjacked by extremists in the Syrian opposition. If Syria and Russia can hold out for long enough, there will truly be no champions of democracy in Syria–as time goes on, Assad’s assertions become self-fulfilling, explaining this desperate attempt to buy time. Assad continues to receive help from Russia, Iran and Hezbollah; the opposition receives only broken promises from the West and support from extremists. Political Islam and democracy are reconcilable, the wrong message is currently being sent in the ME (in both Egypt and now Syria). The “responsibility to protect” (R2P) is about holding governments accountable for human rights obligations, and intervening in the case the government is unable to stop human rights violations, or even worse is perpetuating those violations themselves (as is clearly the case in Syria, and has been since before chemical weapon usage). In this sense, R2P supersedes national sovereignty in certain instances The future of R2P and modernization in the Middle-East and Africa are closely tied. This is not the end failed of the Arab spring–democratization and modernization are time consuming and non-linear processes–the freedoms, human dignity, economic empowerment and security it bestows are well worth it.The time has come when global powers must be willing to use more than words in support of their ideals. Vested interests play by their own rules in trying to secure their hold on power–this is no accountability. The forces of democratization and modernization should recognize this, and know when to work within international mechanisms (such as the UNSC) and know when such mechanisms are being used to shield for violators of the very international laws they are meant to uphold! The international community can’t say we can’t afford to intervene due to fiscal constraints at home–FIND A WAY through joint action! Currently, autocratic regimes in the M-E are weakened and peoples’ latent desire for effective democratic governance is well cited through social media / ICT usage, and reinforced through the results of the UN “My World 2015 Survey” and the Post-2015 Global Consultation on Governance. If we do not seize this opportunity now autocracy will take deeper root, and advocates for democracy will face another era of historic precedent reinforcing the inevitability of autocratic rule / democratic failure in the Middle-East and Africa. Simply put, if the international community does not find a way to protect the interests of civil societies in the M-E and Africa now, it may not get the opportunity again for decades to come. Ultimately, it comes down to ideological differences within the international community. The G20 leaders summit reinforced the idea that we can all agree on the need to cooperate to grow in a sustainable economic fashion–the ideological split is no longer capitalism vs. communism, but human rights v. national sovereignty. How to make capitalism work for sustainable development remains the point of contention. The growing body of both empirical and theoretical evidence pointing to the merits of a human rights based approach for sustainable human development. The UN, the foremost organization for international relations, has adopted a human-rights based approach to development. However, Russia clearly is not committed to human rights, and despite soft rhetoric and better relations between the US-China in recent months, it appears the Communist Party–like the Kremlin–is more concerned with its own survival than the sustainable human development / desires of its’ civil society. It would appear that the ideologies of major global powers a diverging, not converging, even as advancements in the social and physical sciences point alarmingly to the need for concerted global efforts to embrace sustainable human development. I must call into question the merits of the U.N.S.C. veto system, a system in which an individual country can hand-tie the whole international community into inaction. A resolution could be a 3/4 veto-overrule by the UN General Assembly–such a high veto threshold would ensure the U.N.S.C. is only overruled in times of strong international consensus. Permanent Security Council members, including the U.S., would likely oppose such an amendment to the UN Charter. However, if the ultimate result is a more democratic and effective UN System, this is a power the U.S. should willingly give up and a reform we should advocate for. I also wanted to share a response to a well thought out comment in response to the Op-Ed: jfx from Chicago writes: Well written. I appreciate hearing Putin’s thoughts directly, and hopefully his open letter to the US can be reciprocated, allowing Obama to directly address the Russian people on important topics. Due to media restrictions, Obama couldn’t do it; whenever a U.S. official tries to address an issue in Russia they are accused of conspiracy. Even if he could, the Kremlin is insulated from such unimportant things (/sarcasm) as the “will of the people”. This was a smart move by Putin, he is a very calculating man. He knows the value Americans place on the freedom of speech and press, and is playing on that knowledge. This is a move that cannot be reciprocated, and even in the special circumstances it was allowed to happen, it would not have nearly the same effect on policy. The international community will explore a diplomatic chemical weapons deal because it is our collective duty to attempt to destroy these WMDs. However, we must continue to assert our willingness to strike militarily should Russia / Assad appear to be stalling for time and / or restricting access to potential storage sites. Furthermore, Assad must commit to isolated cease-fires within a reasonable time period in order for intentional inspectors and chemical weapons disarmament experts to do their work in relative safety (if we can keep non-extremists from the opposition out of these areas too, and provide security against extremists in the opposition, the Syrian government would be the only remaining party capability of shelling these areas). 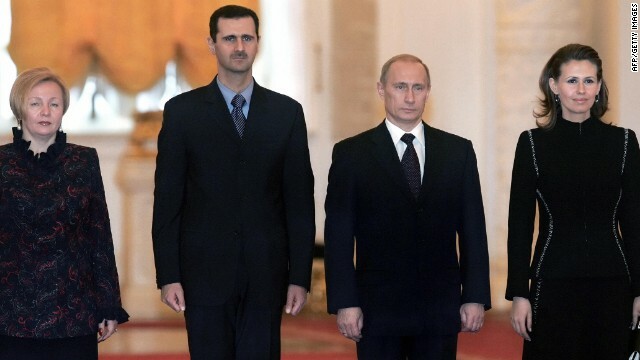 Russia must also commit to cancelling all military contracts with Assad. Assad and Russia have a lot of social capital to make-up if they want to be able to negotiate in good faith with the international community / the Syrian opposition; agreeing to these terms are where they must start. These terms should not be preconditions for diplomatic talks, but failure to agree to any of them could be considered “red-lines” in negotiations (I know we are all sick of that saying but they are a necessary component of any negotiation) and trigger a house vote on military strikes and serve as a signal for the international community to sanction military intervention (if not through the paralyzed UNSC, then individually / through regional blocs). Failure to push for these concessions would represent a failure by the intentional community to properly leverage the likelihood of military strikes against Assad. Categories: Blog Posts, Conflict Watch, Transparency Report | Tags: Assad, chemical weapons, G20, Human Rights, national sovereignity, NYT, Obama, op-ed, Putin, R2P, social capital, UNSC, WMD | Permalink. Up until this point, chemical attack allegations in Syria have been a “blame-game” dominated by circumstantial evidence, hypothetical questions / appeals to logic, murky details, and classified information. The Assad regime has blamed “terrorists”, as they have for the duration of the civil war, for launching chemical attacks. Why would we launch these attacks when UN investigators were in the country, they argue? Western powers do not believe the opposition has the capacity to launch such attacks, and blames the Assad regime of offering too little too late when it came to international investigations (this argument has been refuted by chemical weapons experts, which alongside congressional uncertainty, further complicates U.S. military intervention). The UK dropping out of military strikes, as well as the lack of NATO, Arab League, or U.N.S.C. authorization, makes it difficult to frame a military strike as part of a global coalition. President Obama has assured war-weary Americans there will be “no boots on the ground”, and that a strike will not lead to another long-term entanglement in the region. However, direct military strikes–particularly without broad international support–will naturally lead to further engagement, particularly if Western / American / Israeli interests are targeted in retaliation. I actually agree with Speaker Boehner; we need more information on what intelligence the administration has and how strikes fit into Americas long term geopolitical strategy in the Middle-East. In the face of the sequester and looming budget / debt ceiling debates, how will these strikes be financed? The constraints that military spending impose on other fiscal policies affect all American’s; the citizens of this great country deserve more conclusive evidence the Assad regime used chemical weapons. Basing strikes on classified “knowledge” from unknown (to regular people) sources should not satisfy anyone’s need for a transparent and inclusive debate / decision making process leading up to possible military intervention. Common sense tells us to wait a few days, in order to drum up more international support and get more intelligence from U.N. investigators. There is no sense rushing into action that–despite President Obama’s words and wishes–has inherent long term implications on U.S. military, foreign and fiscal policies. It seems clear that either the Assad regime or more radical segments of the opposition as responsible for the chemical attacks in Syria. We must determine conclusively who committed this crime against humanity and hold them accountable. There has been a lot of talk about precedents being set; if we do not respond to the use of chemical weapons, then international laws banning their use carry very little weight. I agree with this argument, but military decisions should not be made hastily or emotionally. There is no question Bashar al-Assad is a thug who has mercilessly killed tens of thousands of his countrymen and driven well over 1 million Syrians into other countries as refugees, imposing the myriad costs of Syria’s Civil War on the region in an attempt to retain his families 4 decade rule in Syria. I also do not believe a political solution is possible, as Assad believes his rule in Syria is based on something resembling the mandate of heaven. But the question still remains–did Assad carry out these chemical strikes? If we cannot rule out the possibility that opposition forces used chemical weapons, then a much more dangerous precedent may inadvertently be set–that extremist’s can solicit a military response by using chemical weapons on the very people they are supposed to be fighting for. While this is not what I think happened, we must be certain before making decisions with long term and unforeseeable ramifications. Financial considerations should ultimately be secondary once conclusive evidence is presented implicating who is responsible for these attacks. “We cannot afford to hold perpetrators of crimes humanity accountable” is not an acceptable excuse for inaction from the international community. Once conclusive evidence implicating Assad in chemical weapons attacks circulates (or at very least exonerating extremist factions within the Syrian opposition of involvement in said attacks), international intervention can be justified on any number of international law / treaty violations and/or R2P. Syria’s Western-backed political opposition plans to create the nucleus of a national army to bring order to the disparate rebel forces battling President Bashar al-Assad and counter the strength of al Qaeda-linked rebel brigades. Plans for an army are still under wraps but details began emerging earlier this month before the gas attack. It has the blessing of the rebels’ patronSaudi Arabia, which took over as the main regional backer of Assad’s foes earlier this year. A national Syrian rebel army is a good idea for overcoming extremist’s influence–who are often not of Syrian origins themselves–that have tried to hijack the legitimate grievances which originally spurred the Syrian revolution . This Army will require adequate financing and training from Western backers if it is to fulfill its goals. However, one must be suspicious of Saudi Arabia’s intentions in funding this army. Despite being “pro-Western”, Saudi Arabia and many other Middle-Eastern monarchies are fundamentally opposed to the ideas of political Islam, as highlighted by support for the Egyptian Military Coup and it’s “interim government”. It must be made crystal clear in the rebel army’s enabling legislation that the army exists to uphold the will of all Syrian people, is accountable to the Syrian people and it’s future democratic government, and is committed to a pluralistic democratic Syria and international human rights norms. Any Islamist in favor of these goals is free to join the national Syrian rebel army, provided they renounce ties and allegiances to other groups–a precondition for joining any effective and unified army. The last thing we need is another military backed authoritarian regime posing as democracy. 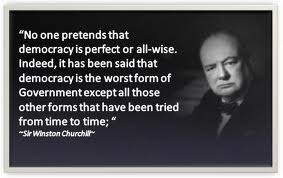 These “democracies” ultimately undermine the ability for effective democracy to take root, by reinforcing the misconception that democracy and political Islam are irreconcilable. It would be tactically advantageous to have this rebel army armed and ready to capitalize after any U.S. led military strikes should such strikes ever occur. It seems like the timing is not right for these two military strategies to synergize, unless this army has been in the works for some time now under-wraps and is almost ready to be rolled out (which is unlikely). It makes sense now for Obama to wait at least a week before taking any action, in order to rally international support for military strikes at the upcoming G-20 talks in Moscow. Categories: Blog Posts, Conflict Watch | Tags: Assad, chemical weapons, crimes against humanity, human rights violations, Iran, Kerry, Middle East, military intervention, NATO, Obama, R2P, refugees, responsibility to protect, Syrian Civil War, United Nations, United Nations Security Council | Permalink. The United States has made a formal promise to Russia not to execute or torture Edward Snowden if he is sent home to face charges of illegally disclosing government secrets, and the Kremlin said Russian and U.S. security agencies are in talks over his fate. The 30-year-old former U.S. spy agency contractor has been stuck in the transit area of a Moscow airport for more than a month despite Washington’s calls to hand him over. Russia has refused to extradite Snowden, who leaked details of a secret U.S. surveillance program including phone and Internet data, and is now considering his request for a temporary asylum. In a letter dated Tuesday July 23 and released on Friday, U.S. Attorney General Eric Holder wrote that he sought to dispel claims about what would happen to Snowden if he is sent home. “Snowden was charged with theft of government property, unauthorized communication of national defense information and willful communication of classified communications intelligence information to an unauthorized person. Russian President Vladimir Putin had expressed “strong determination”, he said, not to let relations suffer over the dispute “no matter how the situation develops”. Putin himself is not personally dealing with the problem, the spokesman said. But he reiterated Moscow’s stance that Russia “did not hand over, does not hand over and will not hand over anybody”. Putin, a former KGB spy, has said Snowden could only be granted sanctuary in Russia if he stopped actions that could harm the United States. Russia granted National Security Agency leaker Edward Snowden asylum on Thursday and allowed him to leave Moscow’s Sheremetyevo International Airport for the first time in more than a month, raising the prospect that the U.S. fugitive will remain in Russia for the foreseeable future and become a constant strain on already-tense relations with the U.S. The decision undermines long-standing law-enforcement cooperation between Moscow and Washington, Mr. Carney said. Russia’s decision also threatens to derail a planned September summit in Moscow between President Barack Obama and Russian President Vladimir Putin, which U.S. officials had viewed as a potential breakthrough moment in a monthslong drive to find common ground with Russia on important foreign-policy aims, such as ending the war in Syria. “We are evaluating the utility of a summit in light of this,” Mr. Carney said, adding that no decision had been made. Following the news of Snowden’s one-year asylum status in Russia, McCain released an angry statement in which he condemns the “disgraceful” actions of President Vladimir Putin. One of Mr. Putin’s aides, Yuri V. Ushakov, said on Thursday that Mr. Snowden’s fate was of “insignificant character” and thus would not affect relations, according to the state news agency, RIA Novosti. He added that the Kremlin was aware that Mr. Obama might cancel his trip to Moscow but had received no official notification from officials in Washington. It is unfortunate that Russia decided to grant Snowden asylum, as more than anything it adds to what the article refers to as the “constant strain on already-tense relations with the U.S”. Russia and the U.S. have a very interesting historical relationship. Despite obvious fundamental differences, since the end of the Cold War both Russia and the U.S. have been able to coexist, and at times cooperate, in global affairs despite mistrust and misunderstanding by both sides. Because of this longstanding yet complex / secretive relationship, every official action between the two countries adds on top of an already long list of diplomatic baggage. The Snowden issue is just the most recent manifestation of the somewhat cooperative yet mostly competitive and ideologically divided relationship that defines modern US-Russian relations. Balking at the G-20 talks would be counter productive; I have gone on record recently (here and here) about the importance of the upcoming G-20 talks. It appears the global community is ready to seriously start addressing issues that require global policy coherence, such as corporate tax evasion, environmental and security issues. Furthermore, it appears the U.S. federal government will simultaneously push legislation to operationalize international agreements, hopefully beginning a trend of coherent global-good-governance. There are a multitude of issues, both bilateral and multilateral, which the U.S. must take a leading role on at the G20 summit. How U.S.-Russia relations evolve from this incident is yet to be determined. A good way to press forward constructively is for Obama to attend G-20 talks. By all means boycott the 2018 Winter Olympics, but the G-20 summit should not be used as a diplomatic bargaining chip, there is too much at stake. In a way, this is a fitting temporary conclusion to the Snowden saga–a life of constant limbo and uncertainty of his own human rights. These are in essence the opposite of core elements of American society–security, freedom, self-determination and expression. For Mr. Snowden, Russia’s hospitality could prove a mixed blessing. The Kremlin has demanded he cease his “political activities” in order to stay in the country, curtailing his potential options for work. If Snowden thought the U.S. Federal government was bad, he is about the meet the Kremlin (sounds ominous no?). The Russian government violates human rights with relative impunity, and uses national sovereignty as a shield from accountability for domestic and extra-territorial human rights violations (most prominently the continued provision of advanced arms to Assad in Syria). Snowden thought he would be a hero, instead he is for all intents and purposes under house-arrest in Russia. If recent events have taught us anything it is that governments with adequate resources, aided with advances in information and communications technology (ICTs), have virtually global surveillance capabilities;. Snowden’s every move will be watched during his time in Russia by both the Obama administration and the Kremlin. In his attempt to expose human rights violations by the U.S. government, Snowden has in effect sacrificed his own rights. He has spent the last few months in Hong Kong and Moscow, not exactly hotbeds for human rights or freedom of expression. His only permanent asylum options at the moment are in Latin American countries, where governments tend to be ill-equip at even providing basic personal security. The U.S. is not perfect–there is no perfect country. Snowden will come to realize in time that in his pursuit of perfection (or fame or more nefarious goals), he flew too close to the sun. The U.S. Government has numerous domestic and international obligations; at times those obligations appear to be incompatible and difficult decisions have to be made. The U.S. government perhaps should have been more transparent about aspects of PRISM, but our leaders believe that by its nature disclosure would inhibit the effectiveness of PRISM, and chose to keep it secret (until Snowden came along). I never got why the collection of metadata by the U.S. Federal is such a big deal to people. After all, private sector corporations such as Verizon already have this data; are we worried that our elected officials have information that private companies already own and probably sell to advertisers? There have been exactly 0 confirmed instances of the U.S. government using PRISM data to infringe of the rights of U.S. citizens. As a country we should focus our efforts on the real issues in-front of us–there are many of them–instead of on hypothetical rights violations by the global champion of democracy and human rights. The U.S. government made it clear that it was willing to issue Snowden a temporary passport to come home and have his day in court. Snowden has officially rebuffed this offer, and after a year in Russia, probably will never receive it again. Categories: Blog Posts, Transparency Report | Tags: asylum, eric holder, G20, global governance, Human Rights, Obama, PRISM, Putin, Russia, security, Snowden, Transparency, USA | Permalink.